Microsoft has set about spending its huge advertising budget by launching a new TV ad that uses Apple’s Siri to compare Windows 8 on tablets with Apple’s iOS on an iPad. The ad, which also feels oddly like one of Apple’s own, even features the Siri voice we’ve all come to know over the last couple of years. 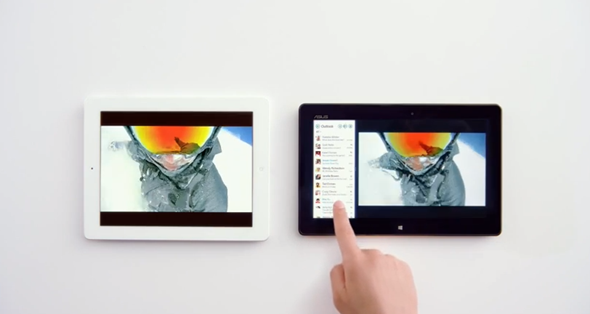 Microsoft focuses on multitasking throughout the ad, with the iPad unable to run side-by-side apps, unlike its Windows 8 counterpart. MS PowerPoint also puts in an appearance, and Microsoft’s much vaunted Live Tiles also feature. Siri’s voice is heard throughout, almost narrating the entire ad. While Siri is forced to admit that the iPad cannot do the things being shown on the Windows 8 tablet – a 64GB ASUS VivoTab Smart – before asking whether they can just play Chopsticks instead. Fans of Apple’s ads will recognize that this is a side swipe at the iPad mini ads which show GarageBand being used to play, you guessed it, Chopsticks. The ad ends with the ASUS tablet being compared with the 64GB iPad on price. The Windows 8 tablet wins out here thanks to its price of $449, whereas the iPad comes in at a whopping $699. It would seem that Microsoft is back to its old tricks of competing with Apple on price, rather than quality or features – a process it honed during the "I’m a PC” advertising campaign of yesteryear. The difference this time around however is that it is Apple who has the market share, with Microsoft having to play catch-up. Whether Microsoft’s old advertising angles will translate to the new world order remains to be seen, but with its huge financial clout behind it, we suspect Microsoft won’t stop until it finds a message that works. With Windows 8.1 due to be released later this year, and Microsoft said to be focusing on smaller tablets, it’s entirely possible we’ll see an add that directly takes on Apple’s hugely popular iPad mini. It’s the Mac Vs. PC war all over again. We’ll have to wait and see who prevails.